Nature's finest! 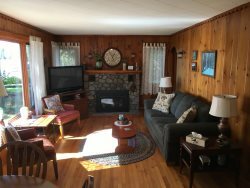 This beautiful vacation rental offers a main house which accommodates up to 10 people and 5 individual cottages that accommodate up to 4 people each. The beach area offers a spectacular view of Butternut Lake and a lakeside dock to enjoy fishing. There are picnic tables and a firepit down by the beach to enjoy roasting marshmallows and having family gatherings. Rental Information for the five Thunderhead Cabins is provided under the Vacation Rentals tab.